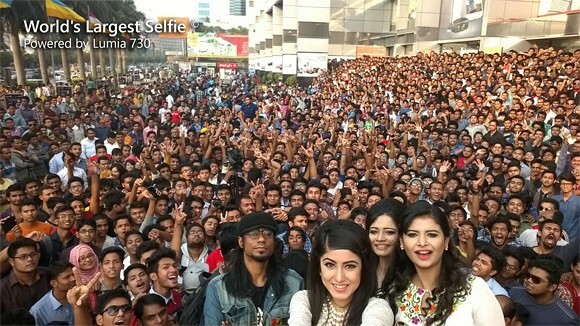 World's largest selfie, taken with a Nokia Lumia 730! You are here: GeekSays Technology News » Microsoft » World’s largest selfie, taken with a Nokia Lumia 730! World’s largest selfie, taken with a Nokia Lumia 730! Lately, more and more manufacturers are launching smartphones with special cameras, designed to take the perfect selfie. One of them is Microsoft, who tried to create some buzz around one of their mid-range models, the Lumia 730 Dual SIM, one of the last devices launched under the Nokia brand. Since its official tagline is “Made for selfies”, something had to be done in order to let more and more people find out what great self-portraits a Lumia 730 can take. And what better way than shooting the world’s biggest selfie can you think ok? During an event held this week in Bangladesh, 1151 people gathered, and using the Nokia Lumia 730’s 5 MP front facing camera, with wide-angle lens, a photo about to make history was taken. All the faces in the pictures can be recognized, otherwise this wouldn’t count for the record. Guinness hasn’t confirmed the record yet, , as Microsoft is still waiting for an official response. Previous manufacturers tried this before, according to GSMArena, but their records were’t confirmed either, but let’s hope that Nok…I mean, Microsoft will be the first one of them to make it in the book. So, how many of your friends did you managed to gather in a selfie?